records, that is; the Asiatic records speak of the vanished lands and peoples "of the East." This old tradition appeared first in modern times through the assumption of Sclater, an Englishman seeking for some "lost links," that long, long ago a great southern continent lay stretched about the South Pole very much as the continental land to-day surrounds the arctic zone. He named this continent Lemuria, to fix more firmly thereby his supposition that on such a continent animals of the Lemuroid type must have been developed. It is a curious instance in scientific history that when Ernst Haeckel, most material of materialistic scientists, came upon this Lemurian hypothesis, he promptly incorporated it into his own working scheme, and in his The History of Creation and The Evolution of Man he speaks of Lemurian creatures and Lemurian traces as if the existence of such a land had been already scientifically proved. His explanation, which failed to satisfy all scientists, was that the Lemurian time-cycle was the only supposable thing that explained certain otherwise inexplicable gaps in the evolutionary theory. (From Mundus Subterraneus; Athanasius Kircher, 1678). FIGURE 42. Outline map showing the locality of Pan, the submerged continent. a fascinating meaning for just such shadowy fables as these. "It is only Nitatahakau," they say; which is to say, "I relate a fable. I am telling an old story invented for amusement." FIGURE 43. The geographical position of Mu. 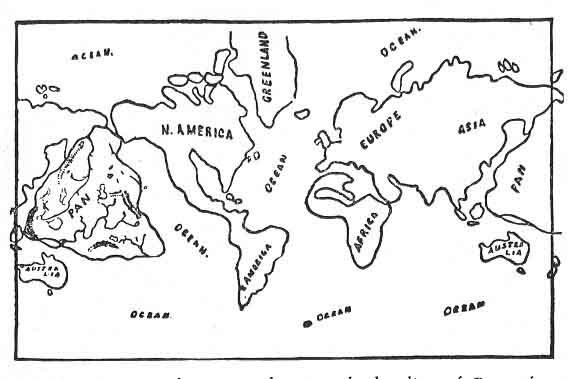 and that a supplementary theory suggests the Pacific basin as the place of the split. We have seen too that a southern continent, antipodal to Atlantis, has been assumed by evolutionists because something like it had to be assumed. Col. James Churchward's recent book on The Lost Continent of Mu is a unique and serious study of this traditional catastrophe in the western waters, carried on over a period of fifty years, during which time he collected all the collectable evidence on this theme, that once upon a time in the western ocean a great continent went down to rise no more. His material is very interesting. Long-forgotten sacred tablets of India describe, he says, among other things, the creation of man in the land of Mu, the mother country of humanity--which land was not the land of Asia. Records of later date describe the destruction of the land, "when the earth's crust was broken up by earthquakes, and then sank into a fiery abyss. Then the waters of the Pacific rolled in over her, leaving only water where a mighty civilisation had existed." He finds the land of Mu mentioned by Plato; he finds "the Land of Mu," or "Lands of the West" in the Troano Manuscript, an ancient Mayan book, and in the Codex Cortesianus, another Mayan book; he finds it in the Lhasa record, and in hundreds of other writings in all parts of the world, including India, Egypt, Greece, Central America, and Mexico. [paragraph continues] Fijis formed its southern boundary. It measured over 5,000 miles from east to west, and over 3,000 miles from north to south. The continent consisted of three areas of land, separated from each other by narrow seas or channels, and on it dwelt 64,000,000 people divided into "ten tribes" or "peoples." It was called the "Empire of the Sun," and it was the centre of the whole Earth's civilisation, of its learning, its art, and its commerce. Its great cities were seven, and its people, being skilled navigators, had sent out colonists to all parts of the Earth. PLATE XVII. 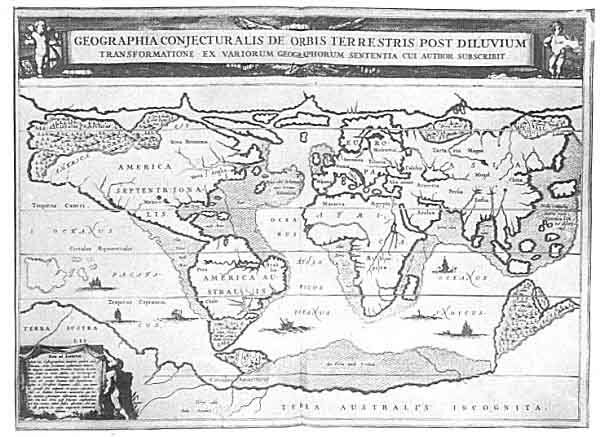 A Conjectural Geography of the Translation of the Earth after the Deluge. (From Arca Noë, Athanasius Kircher, 1665). These are the five great traditional catastrophes of the Earth. After each one of them, according to tradition, the generation of man began again. Again he began to rebuild his world; again began the quest for the knowledge--even for the crafts--that he had lost. Almost like the first men of Earth, he questioned the silent heavens, with no knowledge or wisdom of his own to aid him in his questions or their answers--nothing but vague old tales of something that had happened in a recordless past which had robbed his fathers of a heritage, and had put him where he was, ignorant and alone. What? and how? and why? 83:1 The Story of Atlantis and the Lost Lemuria: W. Scott-Elliot. 1925. 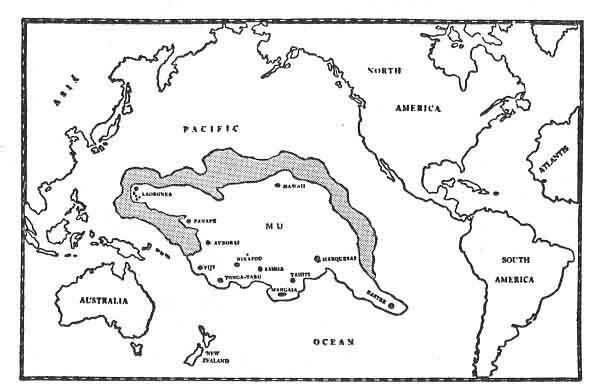 89:1 The Lost Continent of Mu: James Churchward, 1926, pp. 29-30.